Started by President Dwight D. Eisenhower in 1954 and renamed Food for Peace by President John F. Kennedy, the Food for Peace Program (P.L. 480) aimed to supply foreign aid with U.S. agricultural surpluses to fight world hunger, expand international trade, and foster U.S. foreign policy. By August 1966, program spending had reached almost $2 billion and was active in 52 countries. 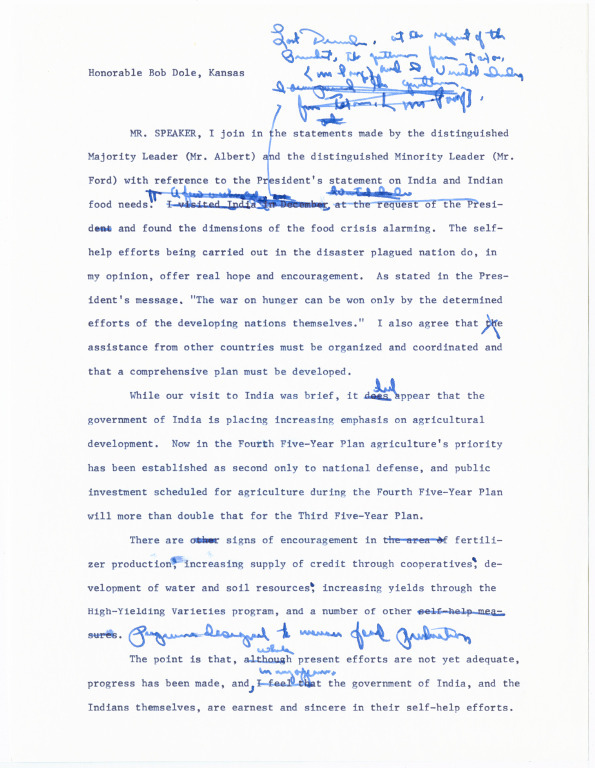 President Lyndon Johnson and his ad ministration tied the program to the Great Society goals of eradicating hunger and poverty. When the 89th Congress revisited the legislation in 1966, it redefined a number of provisions, most significantly requiring that a recipient country’s government propose self-help measures to improve food production in order to receive aid. 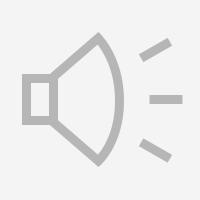 Many countries benefited from program assistance: India, which was experiencing a severe drought and food shortage, demonstrates the complexities of the program in action. 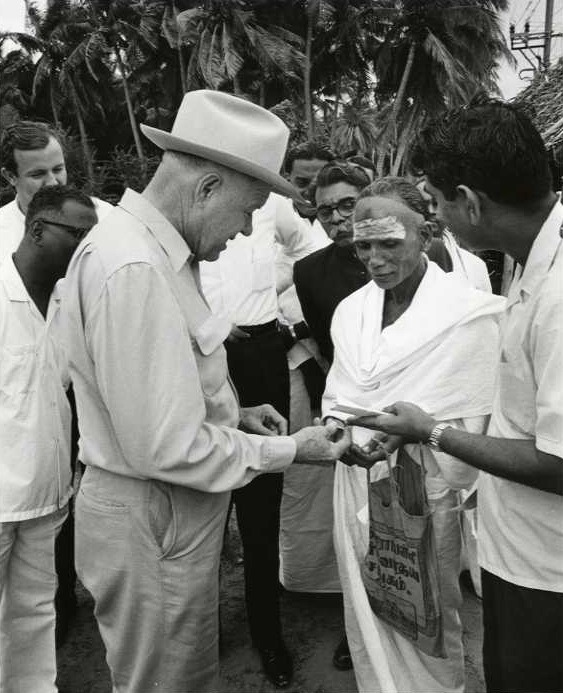 Under criticism for withholding additional aid until the Indian government produced a plan to improve its agricultural performance, President Johnson requested that a four-member House-Senate bipartisan congressional delegation travel to India to survey the critical food crisis. 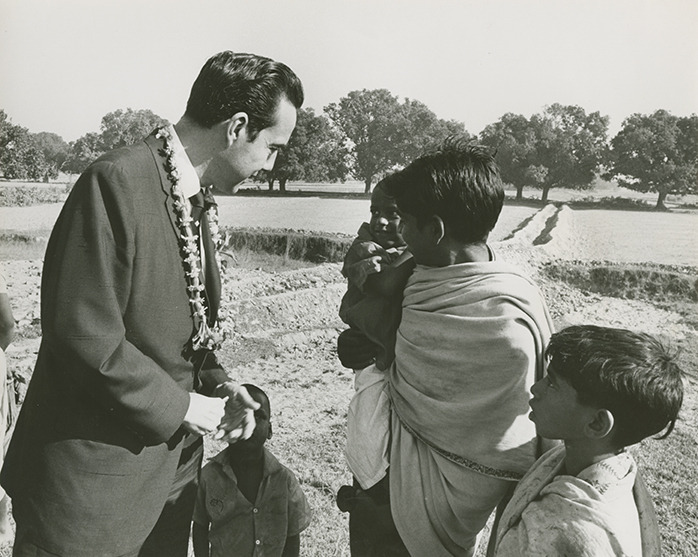 To view more items related to the Food for Peace program and the congressional delegation to India, please visit the Dole Archives, Robert J. Dole Institute of Politics and the W.R. Poage Legislative Library collections. 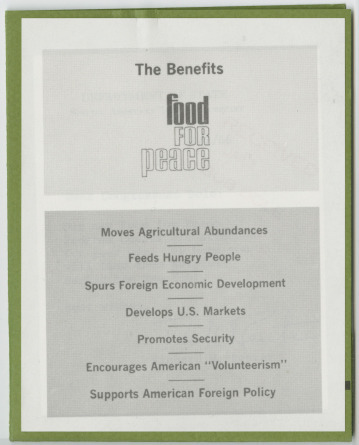 "The Benefits: Food for Peace" booklet contains groups of charts with graphical representations of U.S. food exports as measured by volume and cost. The graphs also compare U.S. exports to other countries and show the impact on the U.S. dollar. 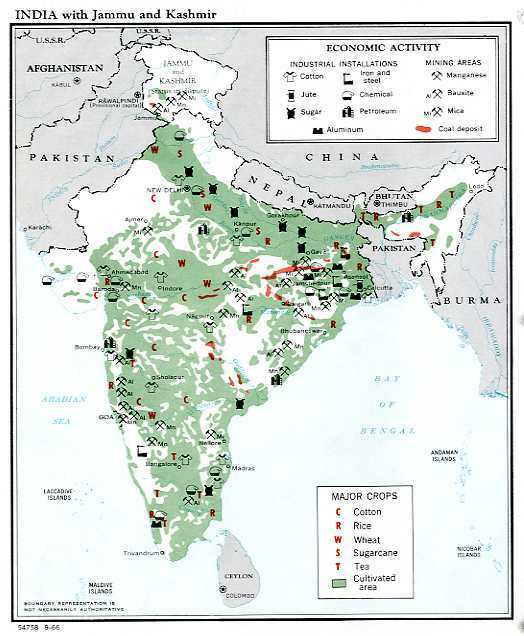 This map of India, taken from Congressman W. R. Poage's binder of information on the food relief program in India, shows major economic activity in the country. 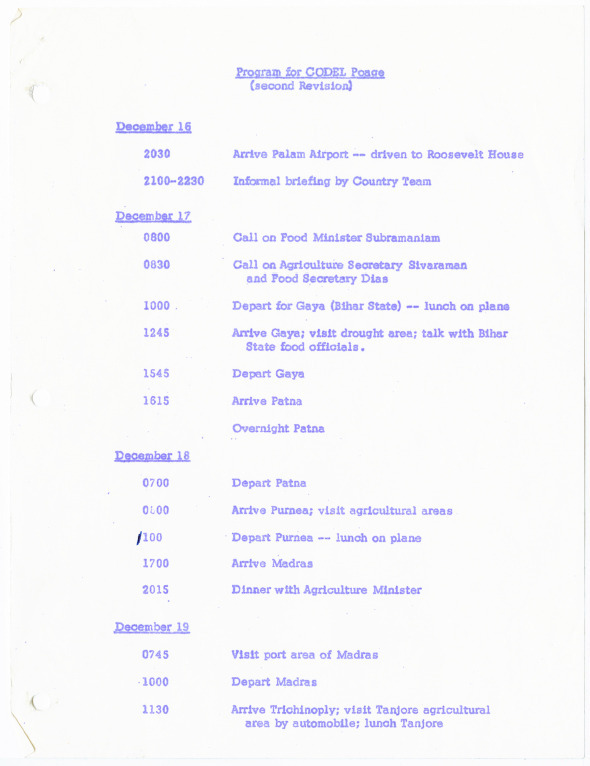 The itinerary notes the major events of the congressional delegation trip to India from December 16-21, 1966. Some of the key meetings and events include a tour of the drought area in Gaya, visiting the port area of Madras, several meetings with the Agriculture Minister, a round table discussion with the Ambassador and Country Team, and a meeting with the Prime Minister of India. 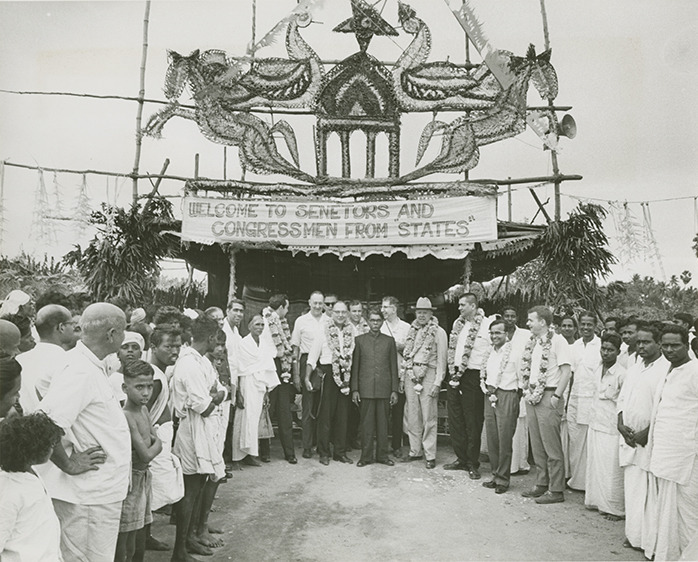 Members of the Congressional Delegation in Tanjoke District, Madras State, in front of a ceremonial tent where they met with farmers and village workers. An introductory video clip includes various scenes from throughout the trip to India as Hyde Murray describes the purpose of the visit. Hyde Murray interviewing Congressman Dole about his impressions of a fair the congressional delegation visited in Madras. Dole shares his impressions of the exhibits on family planning and local handicrafts and says that it is equal to most state fairs in America. Murray then tells how everyone attended a dinner later that night sponsored by the local government. 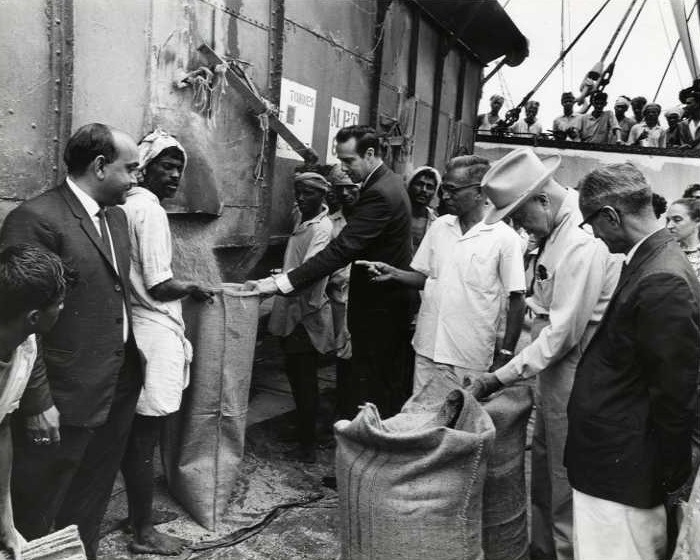 Congressmen William R. Poage of Texas (with hat) and Robert J. Dole of Kansas (dark suit center) watch the unloading of American food grain in Madras harbor on December 19, 1966. The three-man U. S. congressional delegation led by Congressman Poage visited India to take a first hand look at some of India's agricultural achievements and problems. 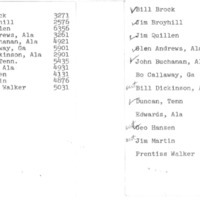 The other member of the delegation was Senator Jack R. Miller of Iowa. 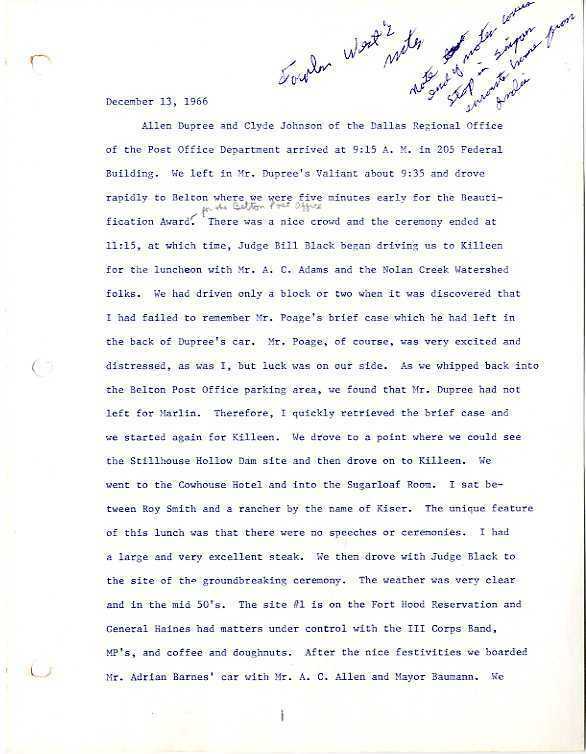 This video includes scenes of the delegation walking down a road, Indians working the land, Congressman Dole watching the work, and village life. Those featured in the video include Rep. Robert J. Dole and Senator Jack Miller. Children crowding around Congressman Robert J. Dole were given pieces of candy by the Kansas legislator. This video features an explanation of flower garlands, inspections of irrigation canals, Indians preparing hemp by soaking jute, and scenes from a village. 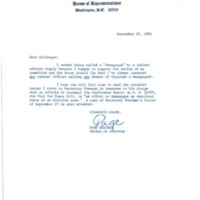 People in video include Rep. Robert J. Dole, Senator Jack Miller, and Rep. W. R. Poage. 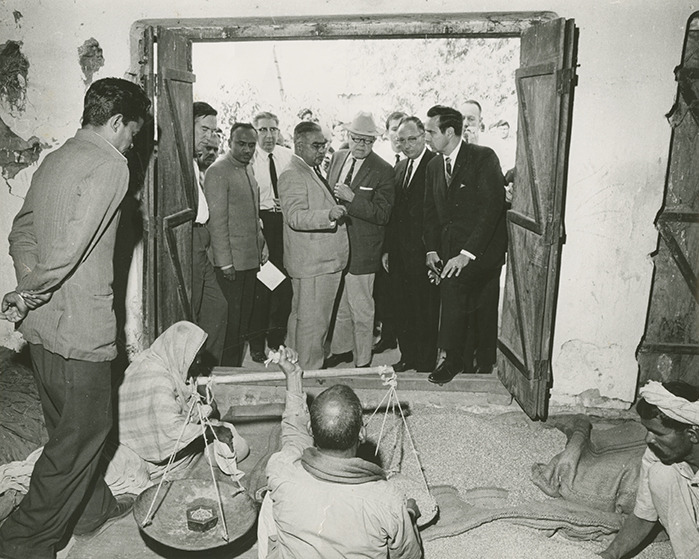 The U.S. Congressional Delegation led by Representative William R. Poage of Texas (center with hat) visit a fair price shop in a village just outside the town of Gaya in the drought-stricken Bihar state and see the distribution of American wheat and milo. 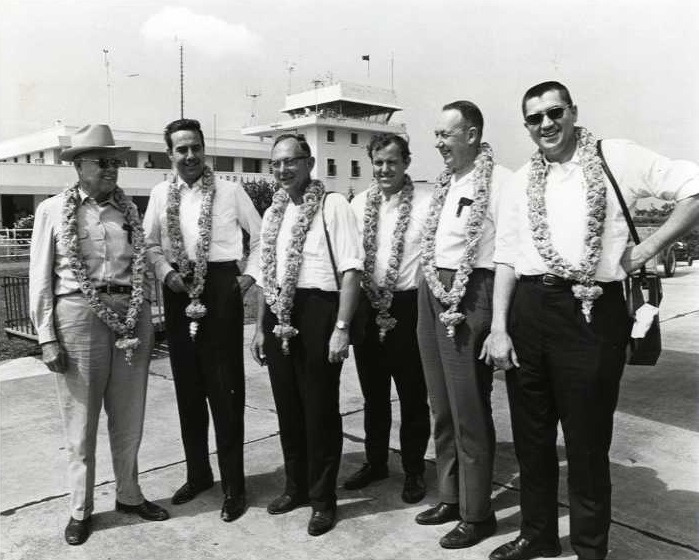 Other members of the U.S. delegation are Senator Jack R. Miller of Iowa (second from right) and Congressman Robert J. Dole of Kansas (far right). 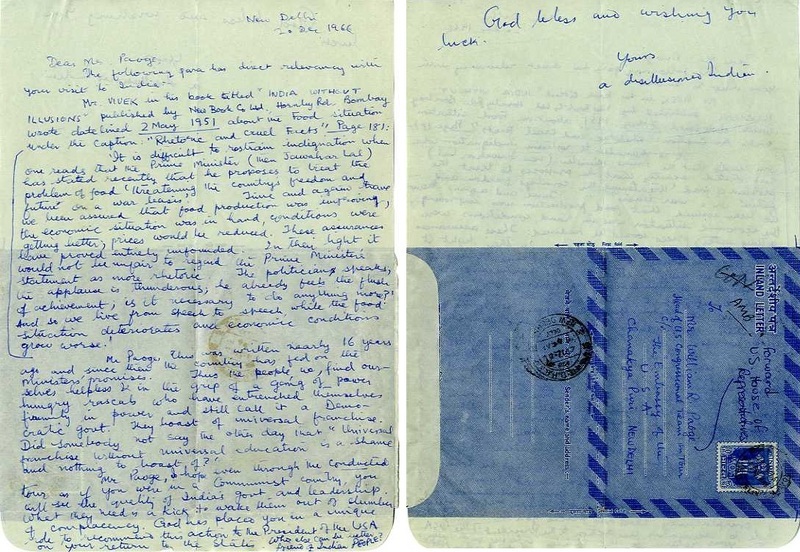 Excerpt of Fowler West's Travel Diary from his agricultural trip to India in December of 1966. Congressman Dole talking with Indian Food Minister Subramanium in Bangalore. Dole thanks the Minister and asks what he would most like to see America do for India in the next few months. Subramanium replies that he would like to see assistance improving their technology, as well as 2 million tons of food for the period of transition. 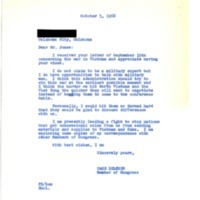 Handwritten letter to Congressman W. R. Poage from New Delhi, signed by "a disillusioned Indian." 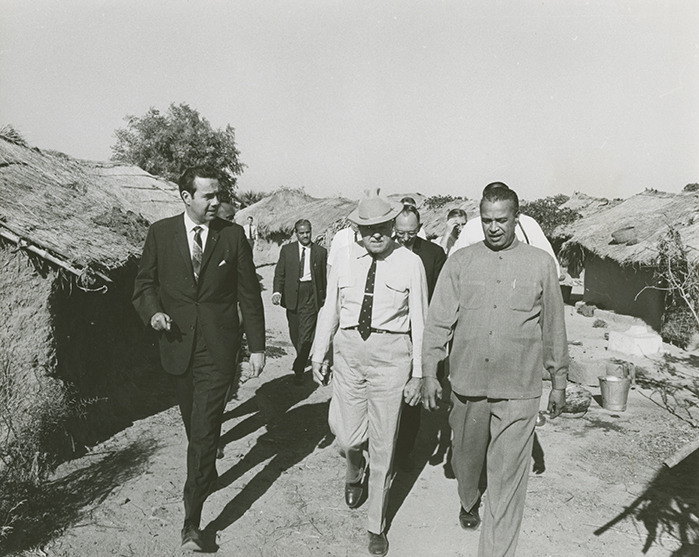 Congressman Robert J. Dole presents his observations from the congressional trip to India. He emphasizes the need to organize and coordinate agriculture assistance through other countries, but he also states that progress in India has been made through fertilizer production, development of water and soil resources, and increasing yields through the High-Yielding Varieties program. Congressman Dole stresses Congress' need to consider India's food needs. 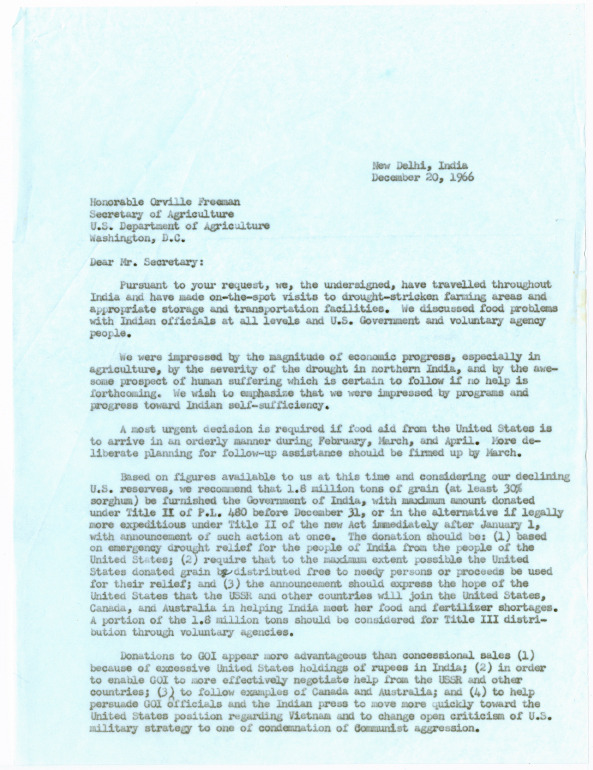 In this letter, Congressmen W. R. Poage and Robert J. Dole and Senator Jack Miller describe their trip to India and urge the Secretary of Agriculture to consider a donation of 1.8 million tons of grain to India. They argue that the donation should be based on emergency drought relief; the donation should be distributed free to needy persons; and the announcement should express the hope of the U.S. that the U.S.S.R. and other countries would join the relief effort. A newspaper article and political cartoon from The San Diego Union titled, "U.S. 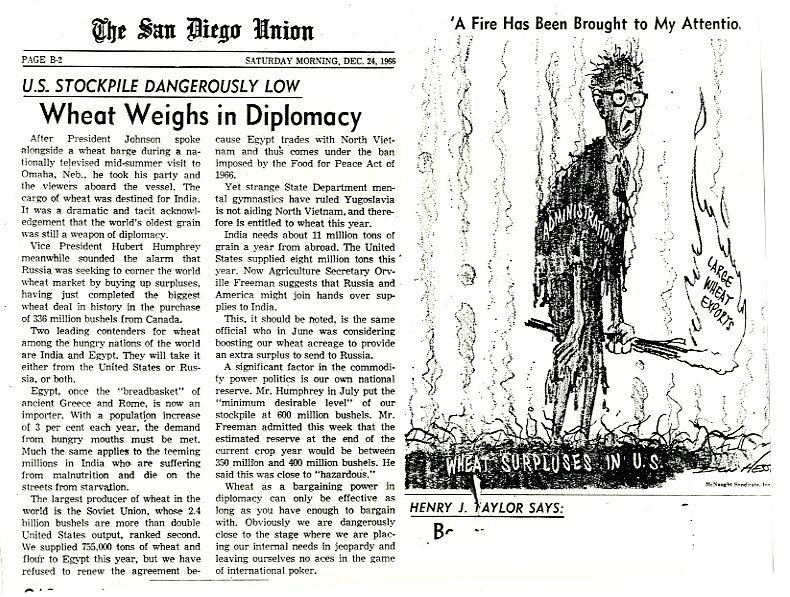 Stockpile Dangerously Low, Wheat Weighs in Diplomacy" and "A Fire Has Been Brought to My Attention," discusses shipments of wheat overseas in the face of diminishing wheat supplies in the United States. 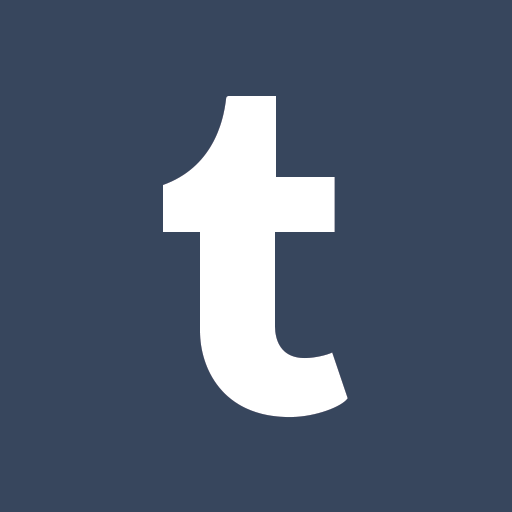 This article describes the U.S. decision on continued foreign aid and agricultural assistance to India after the congressional delegation traveled to that country. 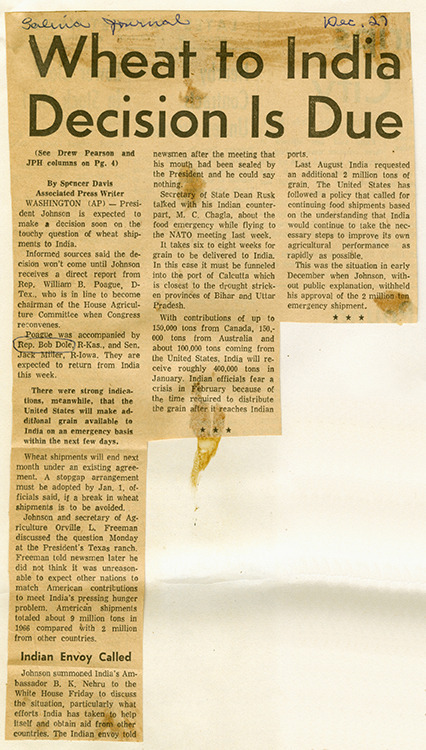 The grain shipments to India would end on January 1, 1967 if President Johnson did not approve an additional shipment of 2 million tons of grain. 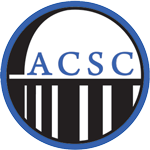 The article discusses the history of U.S. grain shipments to India and mentions the congressional delegation and its report on findings and observations to the President. Food for Peace was up for renewal in September 1966 and it was not without debate. While the legislation had always included language about restricting nations, there was extra concern about explicitly banning Vietnam and Cuba. 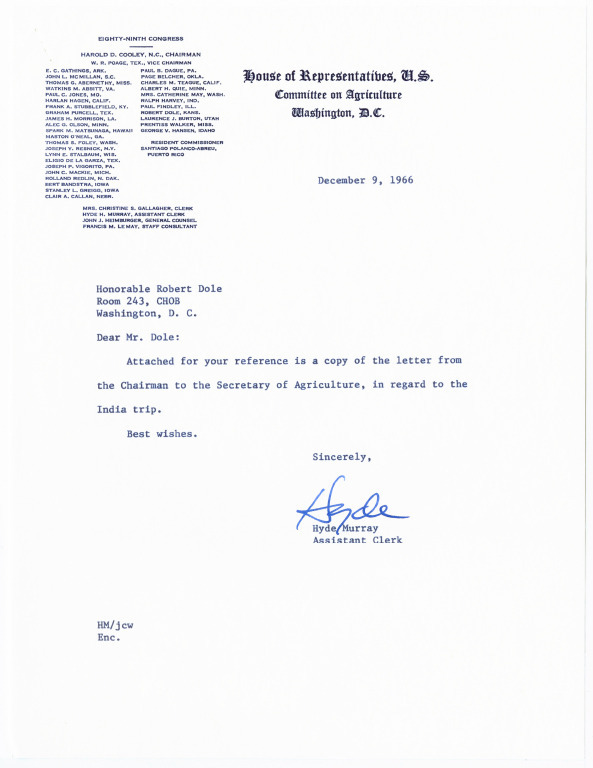 Many different viewpoints on the issue can be found in the following correspondence between Representative Page Belcher (R-Oklahoma), Secretary of Agriculture Orville Freeman, Speaker of the House Carl Albert (D-Oklahoma), and one of Belcher's constiuents from Oklahoma City.